There’s world-class surf a stone’s throw away, ocean views, and a glorious hot tub. What’s not to love? 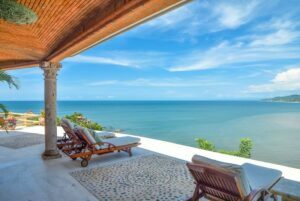 Serenity Rincón Hotel sits hidden away along a tiny winding street on a hill above some of the best surf breaks in Puerto Rico. It’s modern, affordable, and lucky for the seekers of serene vibes, the hotel holds true to its name. Serenity is quite peaceful and feels somewhat secluded, despite being right up the street from the beach and other clusters of hotels and restaurants. 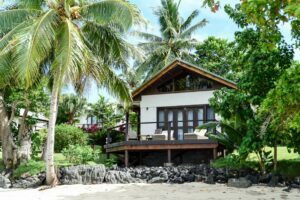 Located on the Northern Coast of Rincón, Serenity was remodeled in November 2015 by three surfer owners and opened its doors in January 2016. With 16 rooms all varying in size, rates range from $75 per night for a studio with a queen bed, to $250 per night for a two bedroom, three bathroom luxury apartment. The look is low-key modern with a touch of rustic. There’s new minimalist furniture in the rooms and crafty woodwork adorning the common spaces. The awesome hotel manager Sara was born and raised in Rincón and also happens to be one of the friendliest people you’ll ever meet. Sara takes care of her guests like family, giving great suggestions on things to do, and meticulous directions on how to get there. It’s like having a personal all-knowing concierge (who really cares about you having a great time). Serenity is a perfect option in Rincón if you’re looking for a modern room with modern amenities without staying at a larger cookie-cutter hotel (and yes, their A/C is fierce). In the Northwest corner of Puerto Rico, where the Atlantic Ocean meets the Caribbean Sea, Rincón is a gem of a surf town known for its creative culture, gorgeous palm-lined beaches, and of course, lots of waves. 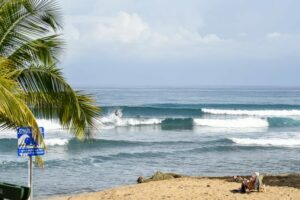 Often called “The North Shore of the Caribbean,” surfers flock to Rincón for world class surf when the currents collide between October and April. Rincón is home to a healthy mix of sun-worshipping expats and locals who’ve helped make Rincón’s town as lovely as its natural beauty. Delicious restaurants, food trucks, and even a brewery are sprinkled throughout the area, and there’s always plenty of smiles and friendly vibes to go around. The closest break is a 5-minute walk away. You can soak your bones in the glorious hot tub after a long day of pumping waves and good eats. Included in the rate is a continental breakfast and coffee served upstairs on the top floor where you can sip some morning brew with lovely views of the sea. The showers are hot (with great water pressure), and the A/C is super cold. 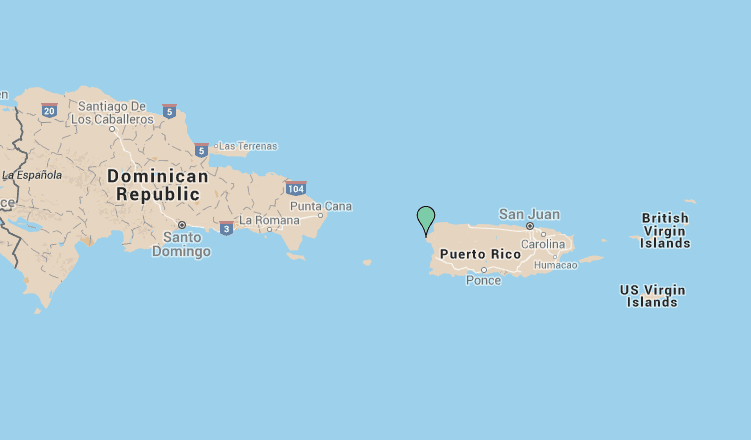 The closest airport to Rincón is Rafael Hernández Airport in Aguadilla (about a 45-minute drive). If you can’t find a flight into Aguadilla, you can fly into Luis Muñoz Marín International Airport in San Juan. Then rent a car and drive 2.5 hours to Rincón. Whether you fly into Aguadilla or San Juan, you’ll need to rent a car, as Rincón is spread out and there aren’t many options for public transportation. A 4-wheel drive vehicle is best if you want to explore the more off-the-beaten path areas along the northwest coast. There’s two roads named “Route 413” – there’s the interior (more inland), and the exterior (more coastal). From town, take the 413 exterior. Then bear right at the fork to go up a hill. At the very top of the hill, turn left right before Puntas Bakery and Happy Bowls (it’s a turquoise building). This road will wind you down to the coast. Take a right after Jake’s Java, then your first right, then immediate left. Then Serenity will be on your left side. *All rates have an added 7% room tax and $30-40 cleaning fee charged only once during your stay (the fee depends on the size of room). Long term discounts apply.